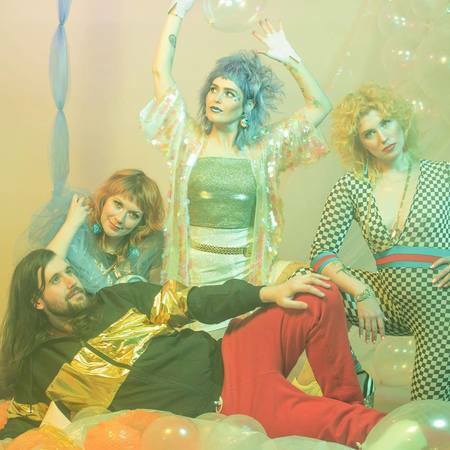 When Seattle band Tacocat-vocalist Emily Nokes, bassist Bree McKenna, guitarist Eric Randall, and drummer Lelah Maupin-first started in 2007, the world they were responding to was vastly different from the current Seattle scene of diverse voices they’ve helped foster. It was a world of house shows, booking DIY tours on MySpace, and writing funny, deliriously catchy feminist pop-punk songs when feminism was the quickest way to alienate yourself from the then-en vogue garage-rock bros. Their lyrical honesty, humor, and hit-making sensibilities have built the band a fiercely devoted fanbase over the years, one that has followed them from basements to dive bars to sold-out shows at the Showbox. Every step along the way has been a seamless progression-from silly songs about Tonya Harding and psychic cats to calling out catcallers and poking fun at entitled weekend-warrior tech jerks on their last two records on Hardly Art, 2014’s NVM and 2016’s Lost Time.